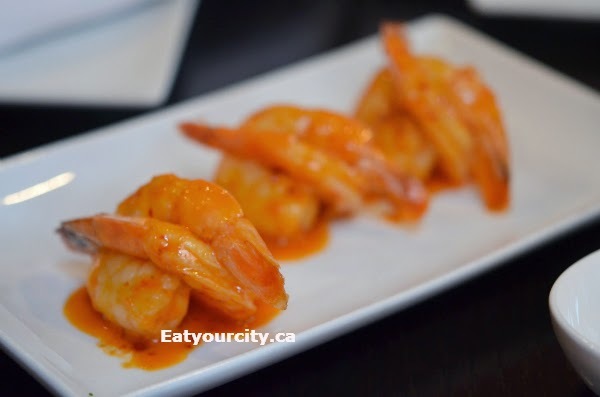 Eat Your City: Tzin Wine and Tapas Edmonton, AB - amazing food, drinks and dessert - the bacon made me forget my name lol! 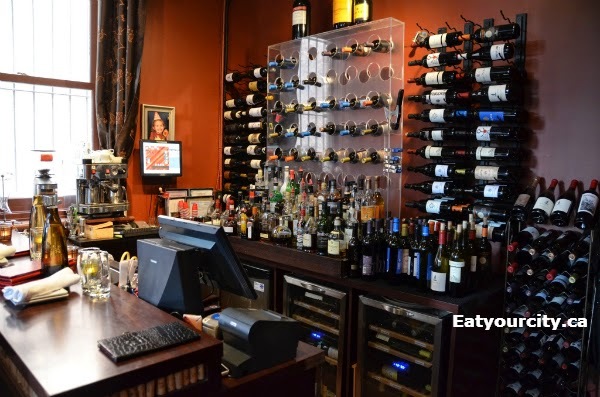 Tzin Wine and Tapas Edmonton, AB - amazing food, drinks and dessert - the bacon made me forget my name lol! Posted by Lots of my friends have raved about Tzin since it opened and finally had a chance to try it out a few months ago (yes, I know - really need to work on putting up posts sooner!). But lets get onto the food! 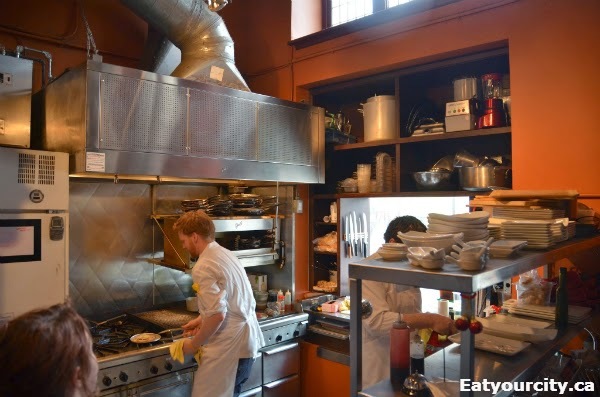 The co-owner's wife Kelsey Danyluk is a gem as she's super knowledgable about every ingredient that goes into the dishes, makes you feel like you're dining in her house and knows a fair bit on all the various wines and ciders available at the tinny bar on the far back wall. 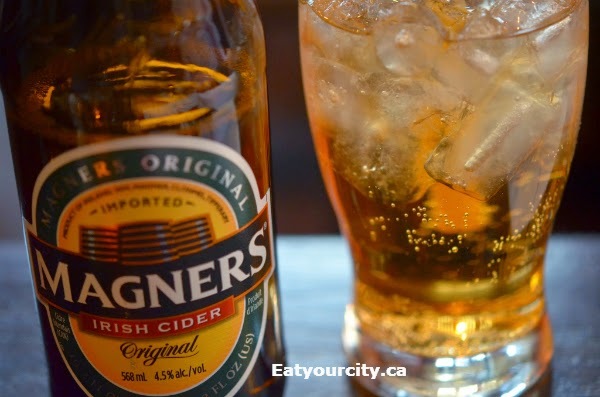 We tried a Magner's Irish cider - nice apple notes and went down smooth like a light beer :P No wine as we had to drive that night, but the cider packed a 4.5% alcohol content anyways. Since there was 3 of us, we practically devoured the entire tapas menu lol! 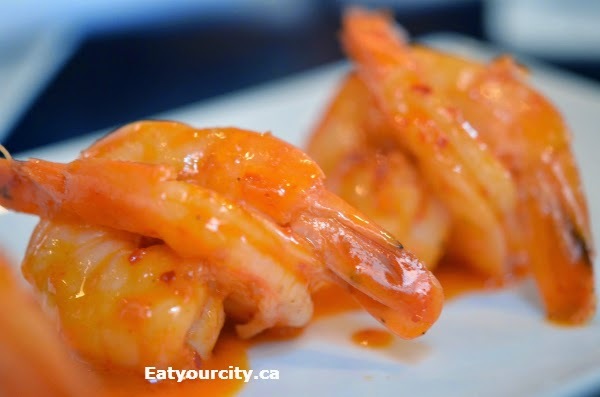 We started with a special of the night - Prawns in a spicy garlic butter Franks hot sauce based sauce. The hot sauce was mellowed out by the butter and surprisingly wasn't knock your socks off spicy despite what the color of the sauce implied. 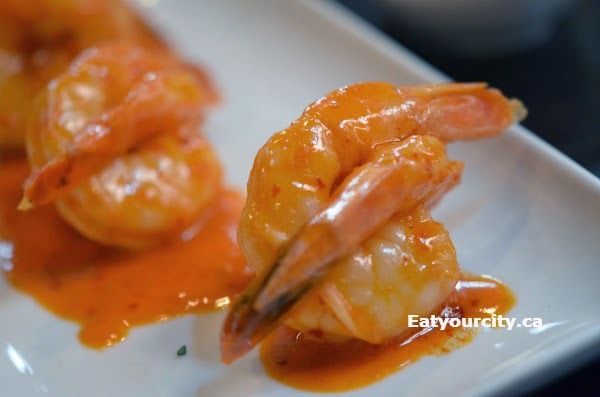 The sweetness of the crisp prefectly cooked shrimp melded with the delicious garlicy, buttery and mild sauce. This was a great start! Mmmm! The Baked Brie with red wine reduction, apple and Saskatoon berry compote and baguette - comfort food at its best. Savory and creamy melted baked brie paired well with sweet apple and tangy-tart Saskatoon berry compote. We had to ask for more bread to not waste any tasty morsel in the brie baker. Only suggestion was to provide sharper knives so folks can cut slices of bread or pre-slice the bread all the way so we're not mangling the bread before we have a chance to use it as a medium to transfer all the delicious brie! Nom! The Warm wild mushroom and spinach tart with Gruyère cheese and Merlot-truffle vinaigrette was another winner. Appearances can be deceiving as it looked like a smushed flattened something covered in fresh greens, but the delicious earthy and savory mushrooms and cheese hits you as soon as you bite in and the tart soon became nothing by crumbs on the plate and a happy memory. The Irvings Farm Fresh Bacon - maple balsamic apple compote, apple mayonnaise, crostini, Calvados gastrique - I think I raved about this bacon for 3 weeks after we had it. Think a thick delectable chunk of Irvings Farm's pork belly.. then imagine it was bacon on steroids. Perched on a crisp crostini, the bacon is slowly cooked until it literally melts in your mouth, exploding with flavors of rich pork belly, just a hint of sweet apple and maple notes and just enough of the gastrique that it cut the fattiness so you're just wanting another and another and another bite of this decadent "bacon". Best bacon dish we've had in a long time... I think I forgot my name for a bit after taking a bit of this deliciousness lol! It doesn't show up on the rotating menu often, but when it does, its a must try - try to eat it and not have a ridiculously happy grin plastered on your face lol! 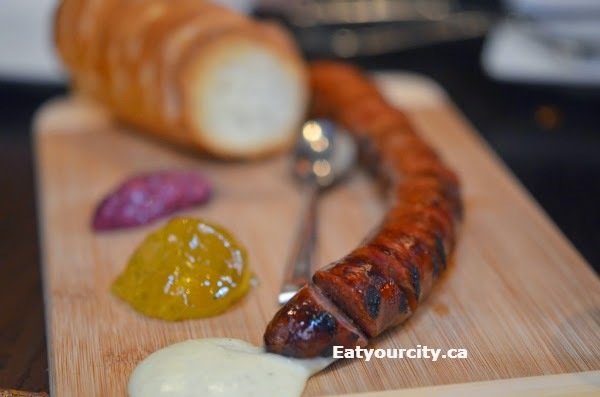 The Grilled Chorizo Sausage with smoked garlic aioli, jalapeno jelly, violet mustard and baguette was presented like a warm charcuterie plate. The sausage from Irvings farm was grilled well and stayed nice and juicy. The sausage had a nice little bit of spicy heat to it that worked well with the smoked garlic aioli, japaleno jelly and the violet mustard that was a really pretty purple color. The Braised duck leg with roasted and smoked potato puree, Beluga and Du Puy lentils, wilted greens, wild mushroom and sade vinaigrette and pan jus was tasty and tender. Strangely, although all of us love our meat, we enjoyed the curried savory lentils out of this dish! 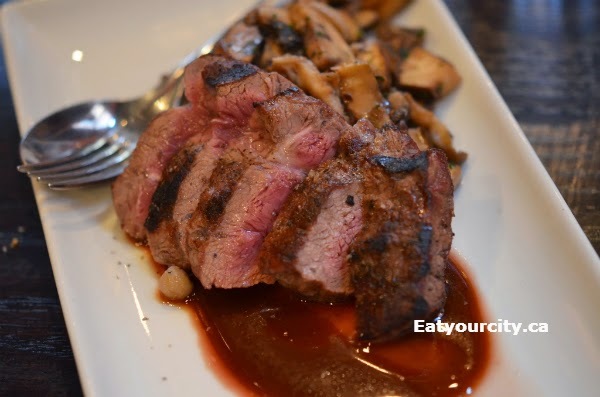 The Grilled Alberta beef flat iron steak with applewood smoked sea salted caramel, bourbon and herbed mushrooms was the only dish that fell a bit flat that evening. flat iron steak is a tough (both literally and execution-wise-ally) steak to pull off. Both me and my boyfriend thought Chef Corey could have easily flexed his culinary muscles to execute a great steak - perhaps using a nicer cut of beef like a rib eye or sirloin, but our friend enjoyed it paired with the applewood smoked sea salt caramel. We were getting pretty full towards the end, so we shared two desserts... the Panna cotta stuffed poached pear with doughnut cake waffle and mulled wine reduction was a winner with a lightly poached pear that yielded nicely to a fork but wasn't overdone to mush. The poached pear had picked up some of the mulled wine reduction without losing its fresh pear flavor, and the panna cotta was delicious - just wished there was more than the spoonful tucked into the pear's core. The waffle made for a nice textural and visual element, but the poached pear was the star of the show! The Chocolate mousse tart with chocolate cookie crumb crust, almond brittle crumble, whipped cream and raspberry coulis was tasty, though it was more of a pie than a tart. The chocolate mousse was made well with a silky, airy and creamy smooth texture. 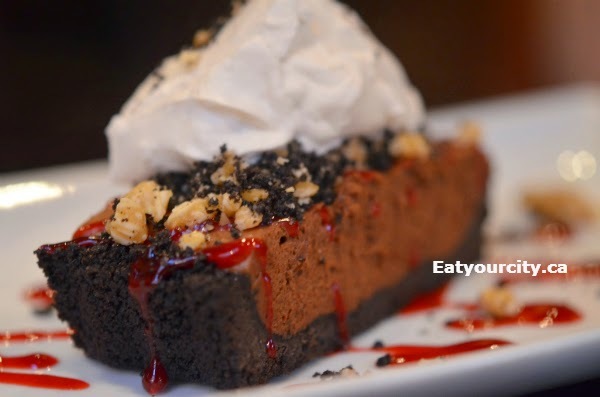 The chocolate cookie crumb crust could have been a bit thinner as it was a bit difficult to cut through, but the flavors brought back childhood memories of chocolate mousse pies - although this one is definitely fancier!